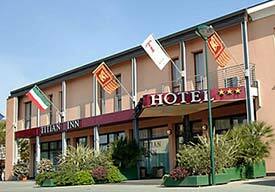 ABOVE: The Best Western Titian Inn is convenient if you have an early-morning flight, since it's only 900 meters from Venice's Marco Polo Airport. The term "Venice airport hotels" is almost a misnomer, because there are no hotels at Venice's Marco Polo Airport. Still, if you have an extremely early flight, you can pick from several hotels nearby: the Courtyard by Marriott Venice Airport (4 stars), Annia Park Hotel Venice Airport (4 stars), Antony Hotel (4 stars), Best Western Titian Inn (3 stars), or the Hotel Gronda Luganare (2 stars). All five hotels are less than a kilometer from Marco Polo Airport, and a hotel shuttle will get you to the terminal at the crack of dawn in less time (and at considerably less cost) than a taxi ride from central Venice or Mestre. Other possibilities near the airport include Dream, Agriturismo Il Melograno, B&B Airport Venice Diego 2, La Noghera. These are good choices if you're traveling to or from the airport by rental car. If your departure hour is more reasonable, a better strategy is to choose a hotel in Venice near the Piazzale Roma, where the causeway from the mainland brings buses and taxis into the historic center. From the Piazzale Roma, it's only a 20-minute trip to Marco Polo Airport via frequent airport buses, but you'll still be able to spend your last night in the city proper. The Piazzale Roma also has special ATVO buses that connect with Ryanair and Transavia/Basiq-Air flights at Treviso airport, and it's convenient if you're transferring to or from the Venice Cruise Terminal by cab. If you'd rather be near the main tourist sites and your flight doesn't leave too early, hotels within easy walking distance of the Alilaguna airport-boat stop at San Marco Giardinetti are worth considering. On the following pages, we've linked to hotels that are convenient to public airport transportation and land taxis.